If you find yourself anywhere near the E3 area of London this weekend and quite fancy the idea of mingling with a choice of over 100 artists at one of the most respected annual art events in East London, then pop by the Bow Arts Trust 14th annual Open Studio event. It's a rare opportunity for any art appreciator, collector, curator or just an enquiring mind to take a behind-the-scenes sneak peek inside the studios themselves. Meet and engage with the artists in their studio environment, ask questions and have a chat, check out their work and even purchase original artworks at very friendly prices. 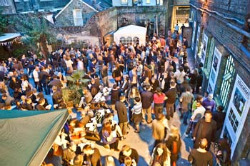 Visitors hail from national and international waters as well as the local community to make this an exciting and diverse event for those who enjoy not only the arts but also a party atmosphere with live music, bars and Thai food stalls in the courtyard garden. On Saturday (1-5 pm), bring family and friends along to join in with a number of artists' workshops for children and parents. A fantastic opportunity for the kids to get involved and learn a few new things about the art world. Friday also brings you 'Can You Hear It?' This year's Open Exhibition from Bow Arts Trust at the Nunnery Gallery, curated by Franko B. The exhibition includes performance, painting, video, photography and sculpture of selected works from 21 Bow Arts Trust artists. On the Sunday afternoon there will be a gallery talk in the Nunnery and two curated studio tours relating to the exhibition. Bow Arts Trust 14th annual Open Studio takes place on Friday 25 June (6.30 pm till late), Saturday 26 June (1-5 pm) and Sunday 27 June (1-5 pm), with curated studio tours at 1.30 pm and 4 pm and an exhibition talk with Franko B at 2.45pm. The Bow Arts Trust is at 183 Bow Road, E3 2SJ.